The adult protein requirement is 0.8 to 1.8 g/kg. High-protein diet refers to the intake of more than 60 g of protein per day or more than 30 % of total calorie intake of protein source. 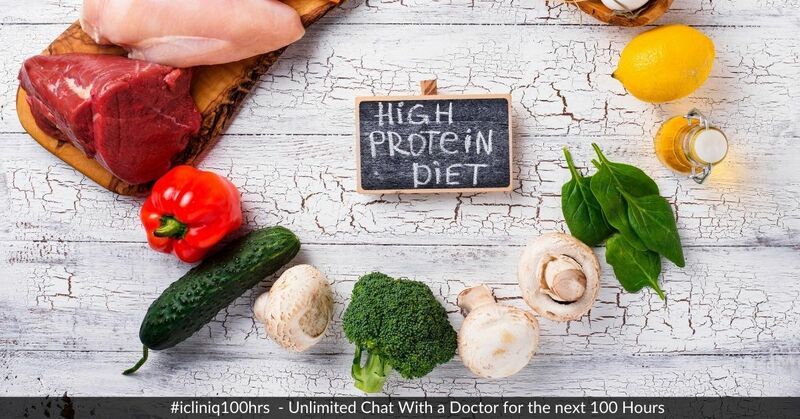 Some high-protein foods are soy protein isolate, boiled green soybeans, whey protein isolate, peanuts, steak, chicken breast, salmon fillet, and canned tuna which have 19 to 80 g of protein per 100 g. Meat is a good source of protein. It also contains a lot of fat than fish, chicken, and egg. Meat consumption in high quantity causes high cholesterol, heart diseases, stroke, and cancer. Hence, high-protein diet is not right for everyone. Research shows that high-protein diet causes osteoporosis. The reason is that the digestion of protein requires the processing of more amount of calcium. The body tends to extract calcium from our bones if it needs to process high amounts of protein. Women who take a lot of protein in their diet lose 35 % of their bone density in the long-term. Loss of bone density eventually leads to osteoporosis. Kindly suggest a diet plan to reduce fat in the stomach area. Can you comment on the imbalances in my blood test reports? What is the treatment for thalassemia major? High protein diets strain the kidney as kidneys are responsible for filtering protein from the blood. At initial stages, high-protein diet increases the frequency of urination. Large amounts of protein have diuretic effects. Thus, the body will respond by extracting water from the tissues and cause frequent urination and thirst. Eating more protein increases glomerular filtration rate (GFR). It is the amount of blood the kidneys can filter every minute. American Academy of Family Medicine says that animal protein in diet causes increase in acid in the body thus forming kidney stones and extracts calcium from the bones. High-protein diet causes damage to organs like heart, liver, and kidneys by accumulating ketones in the body because burning of large amounts of fat causes accumulation of ketones. Thus organ damage leads to organ failure. Protein-rich diet cannot be handled if the liver is damaged, it will accumulate ammonia in the bloodstream (1 g of protein per kilogram of body weight is sufficient in liver disease). High protein consumption leads to increased IGF-1 (a hormone signal to synthesize muscle proteins). High-protein diets also restrict carbohydrate absorption. This results in nutritional deficiencies which can cause constipation. This type of diet does not provide some essential vitamins, minerals, and fiber. A diet rich in carbohydrates such as fruits, vegetables, dairy products, and whole grains reduces blood pressure. Research shows that regularly having a high-protein diet can lead one to develop cancer. While with a low-protein diet, there is low blood levels of insulin-like growth factor-1 (IGF-1), a high-protein diet increases IGF-1 which can cause cancer. According to some studies, a high-protein diet caused hormonal changes in women leading to heavy menses, PMS (pre-menstrual syndrome), and bloating. Proteins are used by the body to make keratin, which is an important nutrient for hair. Proteins also help in the formation of blood cells which carry oxygen and nutrients to hair follicles. A high-protein diet restricts carbohydrates and calories and results in hair loss. Do you have a question on Protein Source or Protein Rich Diet? Why do I feel dizzy often?